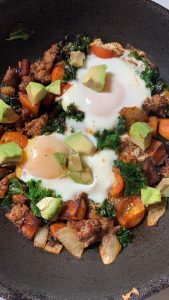 Sweet Potato, Sausage, Egg Scrambler with Chili Powder | Ridge's Stitches | Health Coach. Yoga. Clothing. Did you know that if you store peeled and cut sweet potatoes in a glass of water in the fridge, it will keep them fresh? Neither did I until the other day. Now that I don’t have to go through the hassle of prepping the sweet potatoes, it makes adding them to my breakfast much easier. I love over easy eggs (this means the middle is still runny) because exactly that, the middle is still runny! It creates the best sauce for the scrambler. It’s also kind of fun to cut into it for the first time and see it pour over all your food. You can pretty much put whatever you want in the scrambler but I’ll throw you my recipe below. Oh, and this avocado was stored with a cut onion in a closed container in the fridge and look how fresh it is even after a week and a half! Peel and chop your veggies. Heat oil on medium sized skillet. Add sweet potatoes and ground sausage and cook for 3-5 minutes on medium heat. Add onions, kale, salt and pepper and cook for 3 minutes, mixing along the way. Add in the chili powder and mix together. Make 4 divets in the scramble and crack 4 eggs in the holes. I like to put a lid on it and let it sit for 2-3 minutes on medium heat but if you want to flip your egg or scramble it in, you can do that as well. Top with avocado, salt and pepper, if needed.